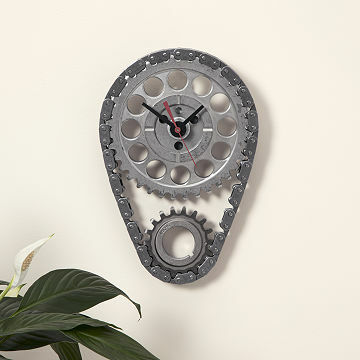 Make good time with an industrial clock repurposed from an engine timing gear and chains. Make good time with an industrial clock repurposed from an engine timing gear and chains. What once kept four wheels spinning takes a turn for the interesting—and the artful—with artist Steven Shaver's vision. Inspired by domestic car parts half-buried in junk yards that looked to Shaver like sculpture with a story, he began crafting creatively designed home decor from salvaged gears, chains, and more, for art and conversation. Shaver calls it "part art." We say it's part art, part clock—and all inspiration. Clock features part numbers cast in the metal and industrial details unique to each piece. Handmade in California. When Steven Shaver swung by a San Jose salvage yard to grab a sun visor for his car, he never anticipated to pick up a new life's calling in the process. A graduate of San Diego State University, with a B.A. in International Business, Shaver owes his now very successful company and obsession with "found art," to that faithful trip in 1996. Since then, Shaver's work has been featured in everything from car shows to TV auctions, with celebrity clients and motor execs racing to get a piece of the car-part action. It's obvious from the time and care Shaver puts into his creations that he's in love with what he does, breathing new life into what others would simply discard. Above all, Shaver hopes his works will make a lasting impression on recipients all over the world, while helping to preserve the planet, "one part at a time." 9.5" H x 6" W; 4 lbs. Dust dry with a lint free cloth. This clock is beautiful and perfect for a car guy! The product was great. It was a bit smaller than I thought, but it is still great. My boyfriend couldnt wait to go set it up. This was a gift for my husband for Father's day as he races cars as a hobby. He loved it! It's a little heavy but that's because the real auto parts used are heavy- really unique, fun piece. There was a card with the artists signature, that made it even more special. Always love everything we get from Uncommon goods!! We have not given it to my brother yet who is acting as our officiant. The clock looks nice. We cannot attest to how well it keeps time. It's smaller than the given dimensions. Telling the time from a distance will probably prove to be tricky, but it is an attractive clock for car enthusiasts. This clock is the perfect gift for any car enthusiast. It keeps time accurately and is very aesthetically pleasing. It also feels very substantial and has proven to be quite durable. I purchased this gift for my husband for his birthday. He is very picky and he loved this! it made a perfect gift and is great for him to keep track of time while in the garage. We agree the clock is handcrafted perfectly & the idea is fabulous! Disappointed in the size, was purchased as a garage clock but it is way too small for such a large area. We will be exchanging it for something more suitable for our needs. I purchased this for a friend's birthday who is a gearhead. I expected it to be a little bigger for the price that was paid for it. Also the chain and belts are not stationary, meaning that it won't stay in place unless it is hanging. After receiving it it was not as expected, looks like something I could have done myself. Perfect for a gearhead car nut!